On chilly mornings and evenings, there’s nothing like a cup of hot cocoa to warm you up. This less-traditional spiced hot cocoa boasts subtle spices to kick the warmth up a notch. Growing up, one of my favorite things about winter was my mother’s homemade hot cocoa. I didn’t care much about playing out in the snow, but I would do it just so I would have an excuse to ask her to make a pot full of cocoa upon coming back inside to warm my frozen toes and fingers. She usually obliged. 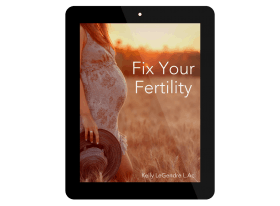 Being a health-nut, her version contained raw goats milk, carob or cocoa, and no refined sweeteners, so there was no problem indulging my hot cocoa-love. 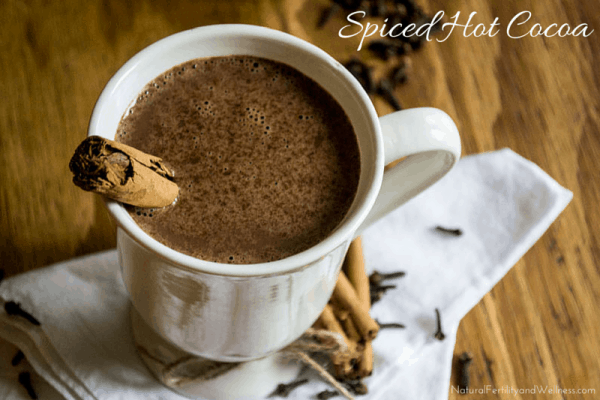 This Spiced Hot Cocoa is a simple twist on my mom’s homemade version. Sweetened with honey, and with the addition of healthy spices like cinnamon, ginger, nutmeg, and cloves, it provides a little extra nourishment to an age-old treat. Cinnamon is a nutritional powerhouse and a powerful anti-bacterial. Its antioxidant properties protect cells from oxidative stress and free radicals, and it’s also one of the most effective substances against E–coli, and Salmonella. The anti-inflammatory benefits of ginger are said to rival those of NSAIDs and come from gingerol, the compound in ginger which helps to lower the risk of infections. Nutmeg contains powerful trace minerals potassium, calcium, iron, and manganese, which help to keep the immune system strong. It also contains a natural organic compound called myristicin, known to shield the brain against degenerative diseases. Cloves are high in antioxidants, can improve digestion by stimulating the secretion of digestive enzymes, and have antibacterial properties potent enough to kill a number of human pathogens. They’re also known to improve the immune system by increasing the white blood cell count. 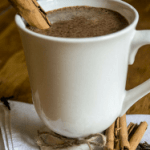 With the addition of these healthy spices, this honey-sweetened pot of hot cocoa is a delicious and nutritious drink that’s sure to warm you up and put a smile on your face, especially when paired with a few healthy chocolate chip cookies or a homemade scone. 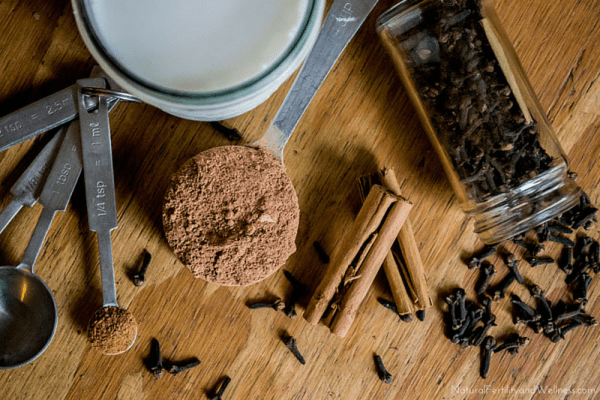 Add extra warmth to your homemade hot cocoa! 1 tsp vanilla extract find out how to make your own here! In medium-sized saucepan, whisk together cocoa, honey, spices, and 1/4 cup of the milk until creamy. Pour in the remainder of the milk and heat through (don’t boil!). Remove from heat and stir in the salt and vanilla. Serve with a cinnamon stick or a dollop of whipped cream. Dairy-free version - use coconut milk. Sweetener substitutes - you may also use maple syrup or granulated sugar in place of honey. Sugar-free version - use stevia or a stevia/erythritol blend. What’s your favorite drink during the chillier winter months? One of my favorite ways to enjoy hot cacao is with healing spices and this looks like a great combo! I love the idea of spicing up some hot cocoa! Looks delicious! I love cocoa with a bit of a spicy kick. Great recipe! warming spices in a warming drink…great idea Raia!! Looks so comforting…I might have to add a dash of cayenne too!! There’s never a bad time for hot cocoa. 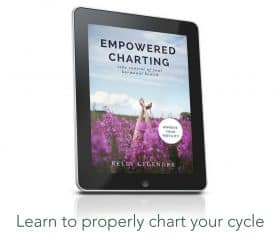 😉 Thanks for stopping by, Chandice. What a wonderful new way to enjoy hot cocoa? Sounds yummy! 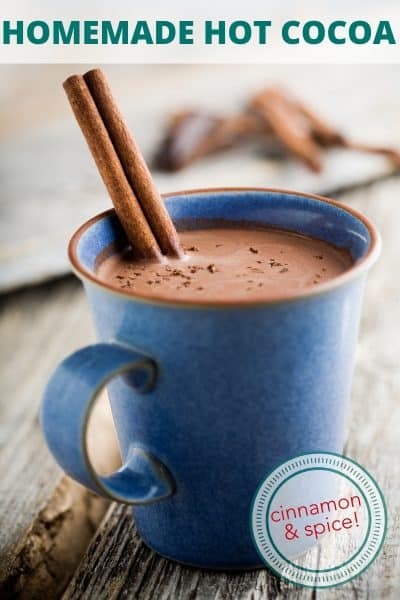 I love hot chocolate with cinnamon but hadn’t thought to try it with the other spices.